Yeah, but: I want to scatter them around the house. 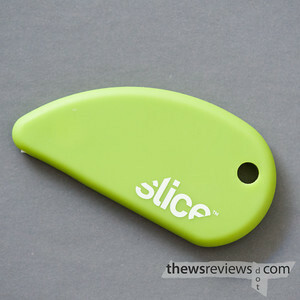 The Long Version: The Slice seems to be a mk2 version of the iSlice that Keith reviewed back in March of 2009. His review made quite an impression, so when I found this one in a local store for $6, I picked it up. It turns out that there have been a few changes over the past couple of years. The best news is that they've dropped the iMitate name and picked up some style points with the new logomark. The opaque plastic has a matte finish that's easy to hold, they've added a lanyard / keyring hole, and the narrow end is still magnetic. 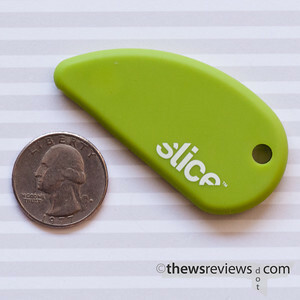 The best part of the Slice's design is that it's no bigger than it needs to be. There's an elegance to that that's rarely seen these days. The tiny ceramic tooth cuts through only one or two layers of paper, but it's too short to draw blood or open plastic bags of frozen vegetables. The impulse is to act as if it cuts like a knife, but instead it needs to be held horizontally and drawn across the surface. Watch out at the end of the cut, though, because it can put a little divot in a plastic or wooden countertop. The Slice is a perfect solution for one minor but vexing problem that I have. The film for medium format cameras comes in lightproof plastic wrappers that are surprisingly hard to open bare-handed. 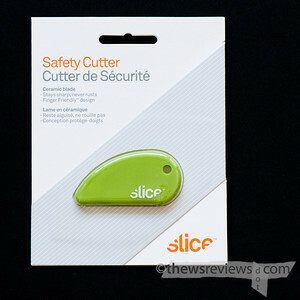 The Slice Safety Cutter makes short work of these packets, but it's so inoffensive that it should have no problem getting past a security screening when traveling by air or visiting New York landmarks. It takes up no room in the camera bag and weighs nothing, but it's still easy to find in a hurry. Perfect. I'll be honest: I bought the Slice because I remembered Keith's review, and thought it was cool. It turns out that it's just as cool in person, and it works exactly the way it's supposed to. It's completely different from other box cutters and 'safety' knives that I've seen; it really works better and it really is safer. Mine now lives on the fridge, and is my tool of choice for dispatching coupons, envelopes, and any other paper that needs to be done away with. I've been tempted to buy another one to keep in my camera bag, or to pick up some of their other products just to round out the family. They're cheap, they work, and they're neat. What more could I ask for?